At Yachtbedding.com, our first priority is customer satisfaction. We make everything custom and take extra care in selecting our materials to provide the best for our client. This is the main reason, most of our clients are our repeated customers. We truly value our clients and they love us. Last week, we delivered a brand new 7” medium firmness latex mattress to a repeat customer. Our customer first used us in 2016 for the forward mattress on his previous Catalina, and then again in 2017 for his aft mattress. 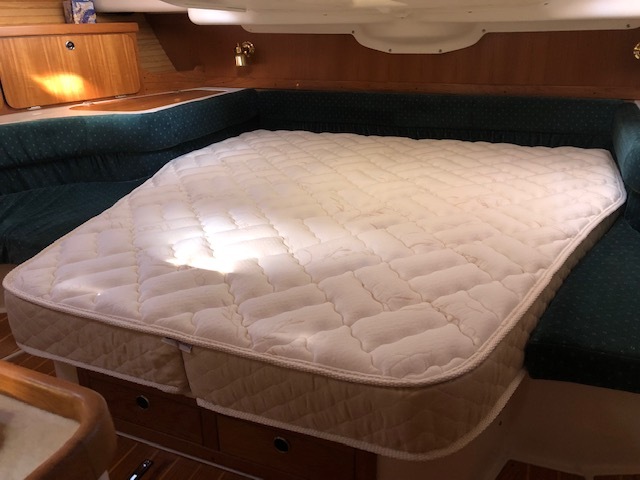 Having just taken possession of this beautiful Catalina 400, our customer knew he had to replace the original 17-year-old innerspring mattress with a brand new, comfy, cool sleeping, latex mattress. As you can see in the image, this is our 7” Commodore, one of our most popular model. Constructed with a 6″ Latex core and covered in an ultra-soft bamboo quilting, this mattress is all about comfort. The benefits of a latex mattress include being mold and mildew resistant, extremely comfortable, latex helps regulate body heat, which allows you to sleep cooler and it is bendable and breathable. Latex is very supportive as it is a high-pressure material that pushes back against you an offers a traditional, spring like feel. The image shows this mattress is hinged. Hinging is a great option when you have storage underneath the mattress, or want to be able to fold it in half for easy removal from the platform all together. With several boat mattress and mattress topper options to choose from, we are able to create a sleeping solution to fit all budgets. We choose our materials specifically to hold up in a marine environment. Yachtbedding.com can be your one stop for all your bedding needs. From mattresses, toppers and mattress pads to sheets, coverlets, duvets and blankets, we have it all. Visit our home page to view our entire line of products and feel free to contact us with any inquiries you have and we will be delighted to transform your stateroom into a STATEMENT ROOM.